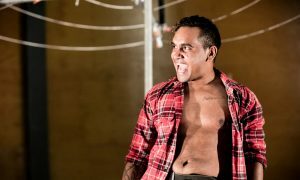 The Man with the Iron Neck examines Indigenous suicide with sensitivity, warmth and a dose of hyperreal. After losing a young family member to suicide, Josh Bond found himself in the midst of an existential and emotional crisis. Grappling with the unanswerable, he became fascinated with the famous 1920s German acrobat The Great Peters: a stuntman whose signature trick was surviving leaps from a 23 metre platform with a hangman’s noose around his neck. It’s this preoccupation with defying death that underlies The Man With the Iron Neck, an aerial theatre show. Co-directed by Bond and Gavin Robins in collaboration with NSW physical theatre company Legs on The Wall, it’s one of the hottest tickets at this year’s Sydney festival. Through the story of an Aboriginal family living in semi-rural Australia, the narrative explores the universal themes of love, loss and the devastation of suicide. Twins Bear and Evelyn are not long out of high school and are living with their mum, Rose, dreaming of life beyond their small town. The close-knit family shares laughter and an easy affection but is still living with the loss of Rose’s husband, the twins’ father, who took his own life years earlier. Then another suicide hits the family, and the trauma resurfaces. The Man with the Iron Neck invites the audience to reflect on what is worth living for when faced with pain and trauma, both personal and inherited. The work was met with critical acclaim when it premiered at Brisbane festival last year, and its themes have only become more urgent: in the first weeks of 2019, five Aboriginal girls under the age of 15 took their own lives, with a sixth taken to hospital after a suspected suicide attempt. Brilliant writing by Ursula Yovich, who in a heartbreakingly affecting turn also plays the role of Rose, has been deftly guided by dramaturg Steve Rogers. The result is an emotional yet humorous and touching immersion in to the heart of family life and the choices we make in life and love. What’s left is the endearing and genuine warmth of the characters, and the masterfully nuanced aerial work led by co-director Robins, an internationally acclaimed director of physical theatre. As the young cast traverse the intense emotions of their characters they also swing in harnesses metres above the stage. The highs and lows of the story are amplified using a simple hills hoist, the large tree that dominates the family yard and some clever set design from Joey Ruigrok. Video designer Sam James evokes the rural bush setting, accompanied by a subtle soundscape from Michael Toisuta and Jed Silver. In a time where youth suicide in Indigenous communities continues to be an alarming trend, this story is one that needs to be told.